TEJAS D110 is featured above on a recent oil scouting trip to West Texas. It was named after the ancient translation of its destination state by Mr Hodges, to whom it was delivered earlier this year. This Santorini Black station wagon was fully restored by the Arkonik team and equipped with a plethora of Hella® spotlights and overland accessories. Read on to find out how Scott has been enjoying his Defender so far, his future plans and his Arkonik experience. 1. 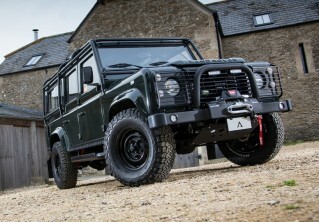 How many miles have you driven in your Defender? 2. What is your favourite trip to date? 3. Do you have any big trips planned? Big Bend National Park in December 2018 with the family 4. What’s your favourite feature on your D110? 4. 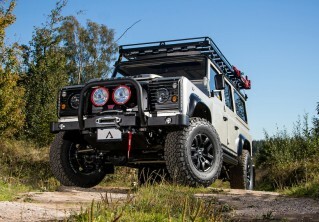 How do you use your Defender? If daily, how easy is it to use as a daily driver? I use the Defender on and off-road. It serves as the daily commuter when the weather is terrible in Texas, as I feel certain I can get where I am going come hell or high water. It’s also the hunting vehicle that I can throw the dogs and gear into and not worry at all. 6. What would you say to anyone thinking of buying an Arkonik? “Among all the companies that ‘attempt’ to restore Defenders, there is only one that truly accomplishes a full and impeccable restoration. From the very beginning, the entire Arkonik team rolled up their sleeves to help in the build process. From paint, to interior, to hardware and accessories, Arkonik’s team was patient and provided amazing advice based on hours of consultation. During the build process Arkonik was in constant communication and when improvements could be made to my selection (not an up-sell like many auto manufacturers) Arkonik reached out to me and would advise me of other options I might give serious consideration to. The process was flawless and the ENTIRE Arkonik team is to thank for that.